Specific manual for Pyramid Arena here. 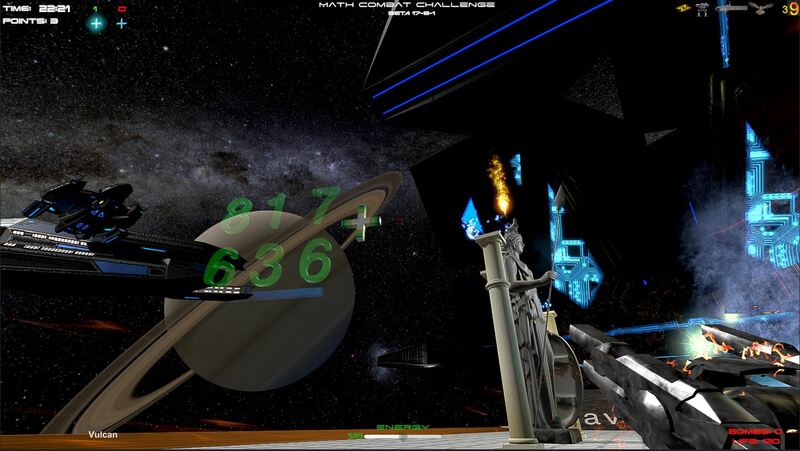 (A typical Math cadet moments before exploding in pieces while participating in a Math Combat Challenge). Remember: in starship, F1 to start engine, F2 increase speed, F3 decrease speed. C for combat radar. In Realm of Helheim you can’t turn off engines, and radar is not operative. Cloaking and missiles are also deactivated. 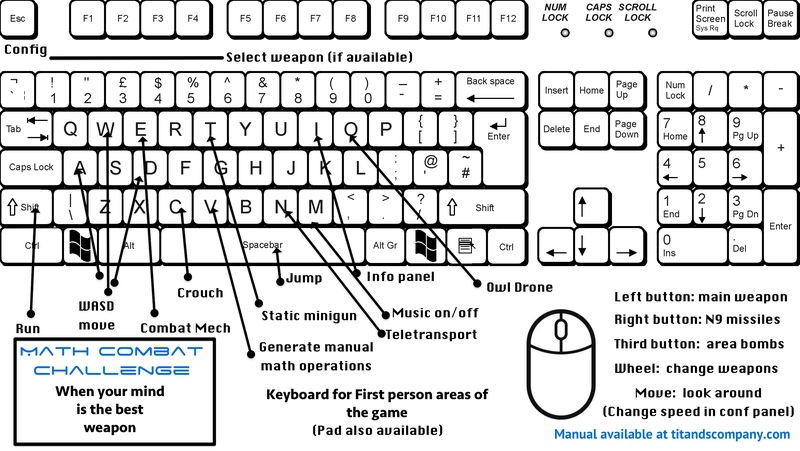 Keyboard map for surfaces areas here. 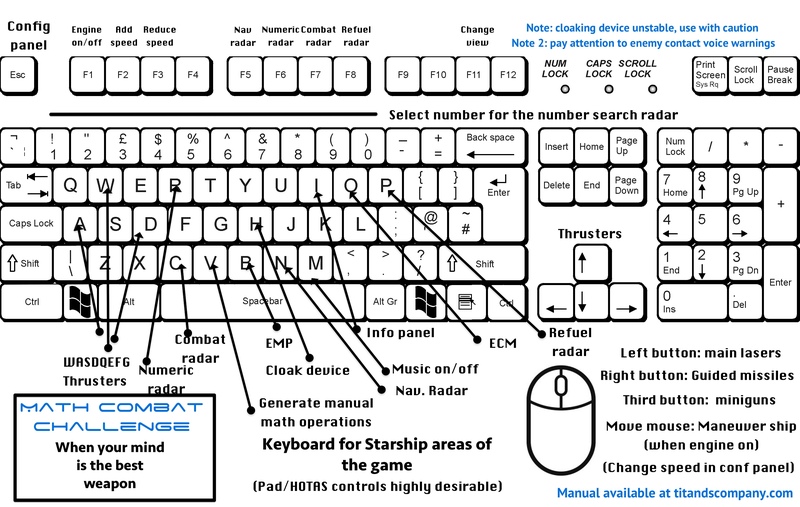 Keyboard map for starship areas here. Pad map for surfaces areas here. Pad map for starship areas here. HOTAS map for starship areas here. Hud for surfaces areas here. Hud for starship areas here. Intro video of the game here. Tutorial video #1 (basic) here. Tutorial video #2 (surface game) here. Tutorial video #3 (space game) here. 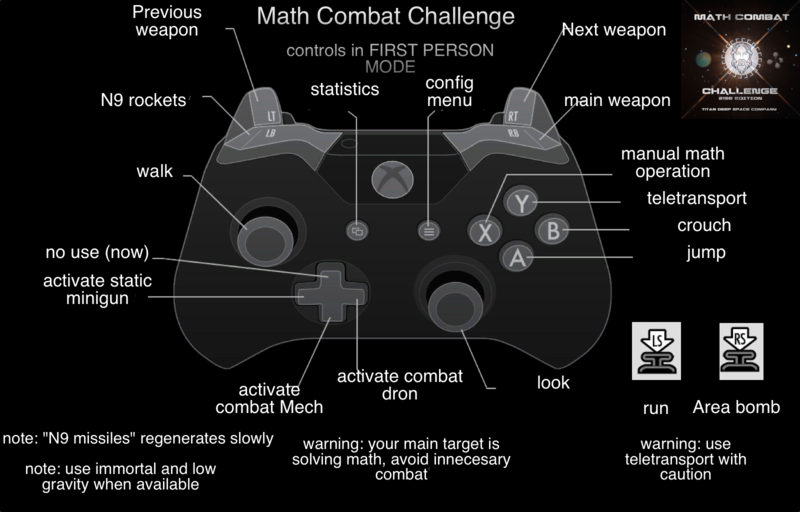 This is the quick tutorial to understand the basis of the Math Combat Challenge game. Not all things in the game are explained; some of them are hidden by design and will help you win the game. Below you can find the advanced tutorial and important info about how to survive in surface areas, and how to pilot the starship. 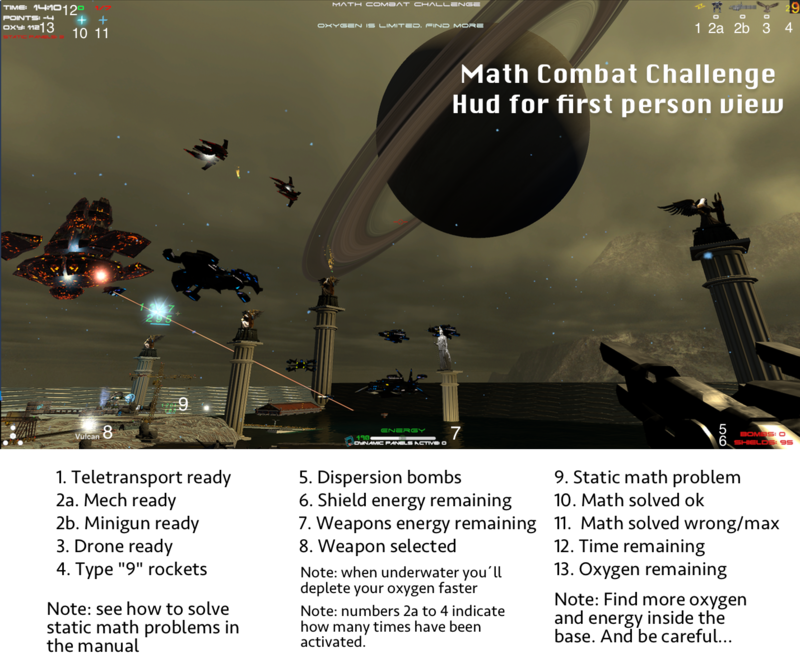 Math Combat Challenge is a survival game with first person view areas and space combat areas that we call “arenas”, where you’ll have to survive until you solve all the math problems randomly generated. Is inspired by the novel “Messenger of the Nastrond” that is part of a science fiction saga of 12 books. 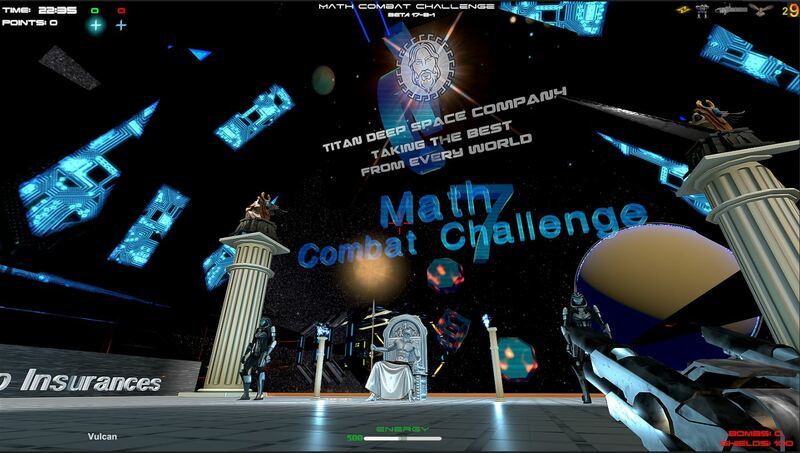 In the book, the Math Combat Challenge is an event that is sponsored every three years by the Titan Deep Space Company, and where only the best math soldiers survives. 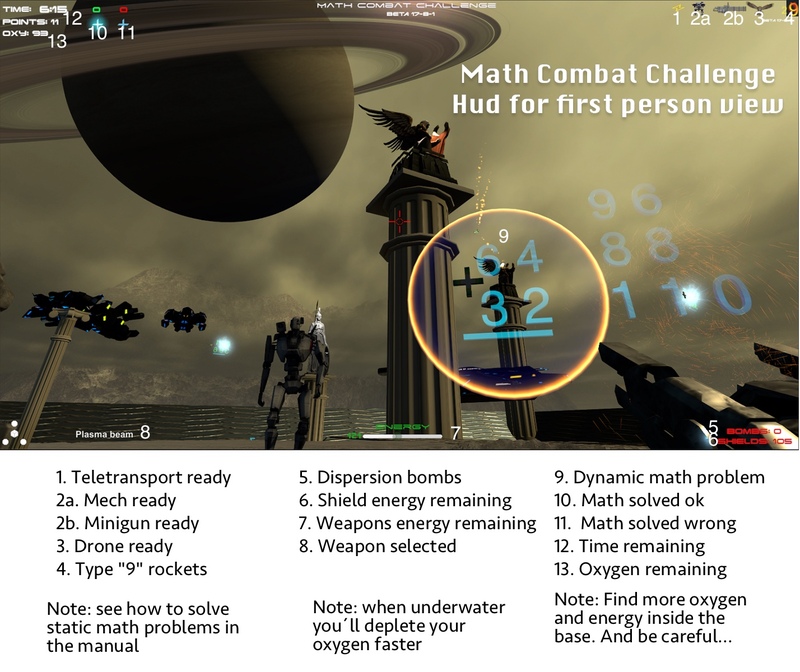 Math Combat Challenge is for that reason also a educational game, because it forces you to use your mind to solve problems while the enemy is trying to disturb you. 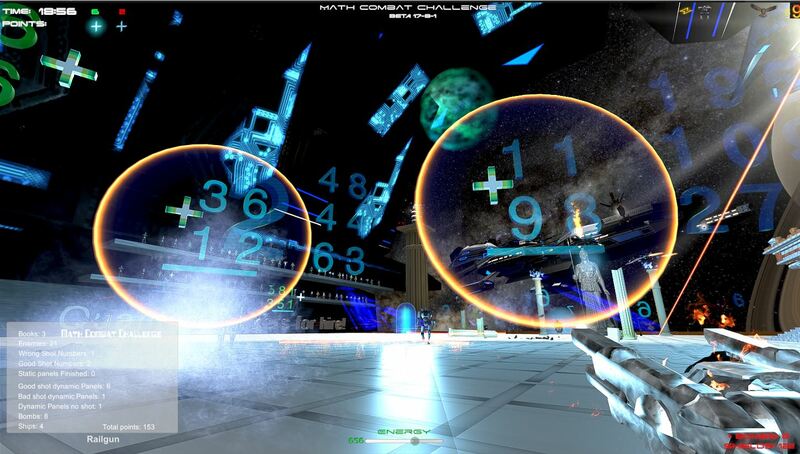 Important: the only objective of Math Combat Change is to entertain the player. It can help with math, and in fact you’ll have to learn to solve math quickly, but this is a game for fun, nothing more. 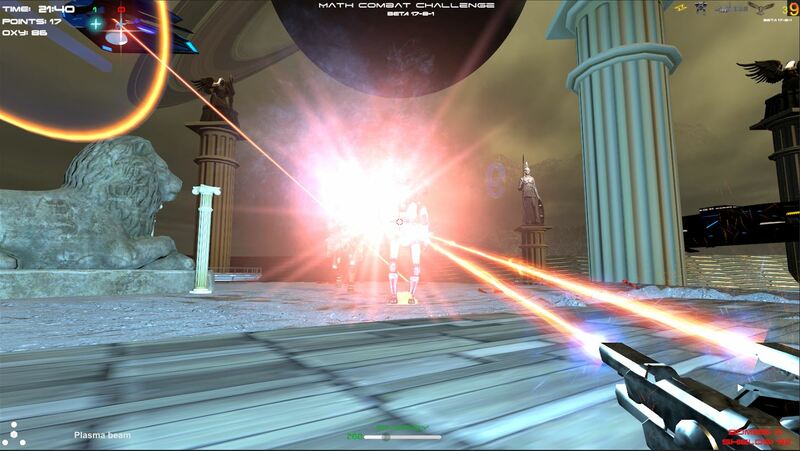 Math Combat Challenge is also a spatial game, because you fight with science fiction weapons in alien environments. Some of them are surface arenas, others are in a starship in space. But the essence remains: solve math problems. That’s the key to win. You can destroy as many enemies as you want, but if you fail with math, you’re done. The game has right now four arenas: one is a stadium and it is played in first person. The second is developed in the form of combat with space fighters in the area of the rings of Saturn. The third arena is set on the surface of the Titan Moon of Saturn. This arena has some exclusive elements that you´ll discover by yourself. The fourth arena, Math Garden for kids, is specially designed for children. More arenas will come soon after the release, two of them for free. The main menu is where the game starts after the intro video that you can stop by touching the “A” (pad) or spacebar. You can see, and we recommend, seeing the videotutorials and this documentation, and read at least this quick tutorial. By the way, game statistics are stored in the game, while Steam statistics are, well, stored on Steam. The green button below sends you to the Titan Base. Move with the pad or with the arrows, you can also use the mouse. Stadium Arena: it runs inside a space base. It is played in a first person view. 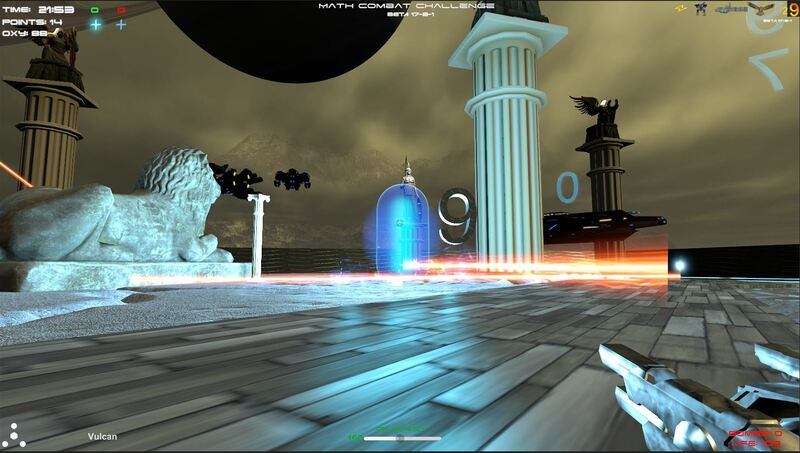 Asteroid Arena: located in open space, you command a heavy fighter starship. It is very important you understand the basics of how to operate the ship. 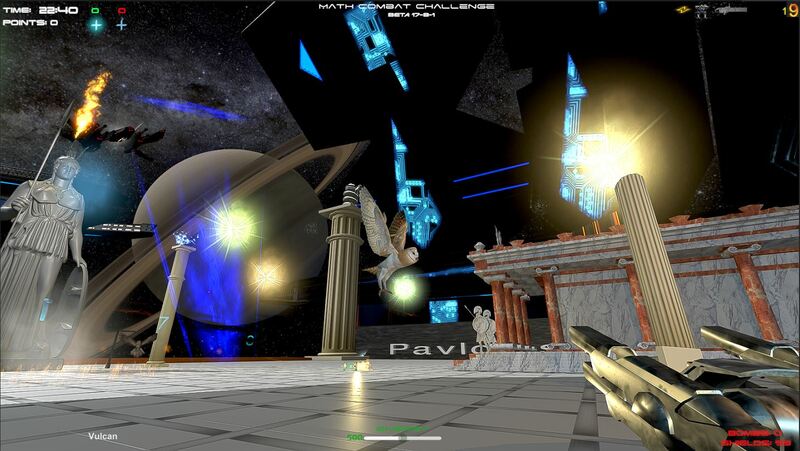 Titan Arena: also in a first person view, it contains its own surprises and new elements. You must first finish the Stadium tutorial in order to access the Titan Arena. Also remember that when in the Titan Arena you need oxygen. You can find it in some places. Also in random places inside the forsaken base. But remember: strange things happens inside that base. Math Garden for kids: a surface arena specially designed for kids, with no enemies and a water hose. Fixed/static panels fall down from the sky (surface arenas) or are inside the starship (space arenas). One of them is always active, and has a halo or circle around it to indicate it. The others lack the halo around them until they become active. You must solve the active fixed/static panels by looking for the numbers on the stage (in surface arenas they are running along and across the area), and shoot those numbers, until you complete the exercise. For example, if the problem is a simple 12+34 you must find the 6 and the the 4. The panel will be deactivated, and another will be activated randomly until all the panels are completed. Be careful; every bad shot takes points and energy, increasing with every new error. IF you have activated the help drone (in the config panel), it will come to you and will mark where the panel active is. A panel above the help drone will give you information about what to do. You can change the complexity and/or type of the operations generated by the static math panels in the config panel. The other type of panels you’ll find in the game are the dynamic panels. They appear for a few seconds, and show three possible solutions. You should shoot the right solution (if there is a right solution, also configurable) before the panel disappears. Be careful; in the middle of the battle, while you’re fighting the enemy, you can aim badly even if you know the right answers. Besides, some panels move randomly. Shooting the bad solution will subtract energy and points. If you make too many errors (configurable) the game ends. You can generate random math problems manually if you want to. But be careful; the automatic panels will persist appearing randomly. And remember: the enemy will try to attract your attention by using everything they have in hand. Defend yourself, but your main target are the panels, not the enemy. All this while trying to survive in the environment to different attacks that will occur constantly. The Angel of Helgeim is only found on the mainland sceneries. He has a special quality: he is immortal. You can shoot him, and this will make him run. But he’ll be back after a while, and when he passes near the player, he can shoot him. His shots are not powerful, but when repeated, and taking into account that the player must be fighting against the other characters, it makes it really dangerous. Another quality of this character is that from time to time he chases the numbers that travel around the scenery, exactly the ones you need to solve the mathematical panels, and destroys them with his lightning bolt. Obviously this is a problem if you are distracted by other characters, and then you need that number to finish a panel. Ah, on rare occasions there may be two of these characters. Important: this character can be disabled in the control panel. Important: you can get six different weapons using the same basic cannon. But you’ll start with just the first one: the vulcan cannon. You’ll get more weapons, more powerful, once you start solving the static panels. Be careful: the more powerful weapons drain more power from the energy cells. When in the starship, remember: you should learn the basics of how to operate the instruments, specially radars and weapons. We’ve recorded a basic tutorial for that. Important: you must activate the starship engine to move (left stick click or F1). Important: weapons are deactivated in navigation mode. The Combat Radar, Number Radar, or Refuel Radar must be active to activate weapons. How to find the numbers to complete the static panels when in the starship? Click the “r” to activate the radar programmed to find numbers. Then click the number you want in the keyboard. Or, if you have a pad, push l-pad and repeat the process until the text above indicates you are searching the right number. When you are near the number, shoot with the lasers or minigun. Repeat the process until the static panel is finished. Another panel will appear until all of them are finished. Number eight is near, but don’t forget to solve the dynamic panels meanwhile! Remember: while you’re doing this work, different enemy ships will try to destroy you. In the landscape areas it´s the same; Don´t forget to defend yourself. The ship has important offensive and defensive weapons. Study them carefully. Last, but no least. There is a special kind of enemy, the letters, that when they explode release books. These books give energy when you shoot them, and in the context of the game and the novel from which this game is born, these books are sent to a library, and are used for the orphans of the constant wars that ravage the Earth (again this is part of the novel that inspires the game). Books will have other functions later in next versions of the game, with a Virtual Library. From now, if you want your book to appear in the game, send us an email with your interest and will give you info about how to proceed. The first 50 books will be included for free. The game has a group of statistics and achievements that will accumulate while you play. There is also a rank for those who want to go the top. This is inspired in the US Navy ranks, but this game is based in a scifi novel, and ranks have changed from now. More ranks will be included in the future. The game is set in the year 2156 in the novel “The emissary of Nastrond” which is an extension of the two novels of “The entrails of Nidavellir”, and is written by chapters on the game website. The web in turn is a simulation of the fictional company “Titan Deep Space Company” that sponsors the championship. Now we’ll see some more advanced concepts of the game. • Main weapon (surface arenas). The main weapon has several modes of fire, each of them better adapted to different types of enemies. They can be activated using the mouse wheel or the pad (or the alpha numbers), and the next one always consumes more energy than the previous one, although it is more powerful. The flamethrower is however a very useful weapon at short distances and when several enemies lurk from close range. However, weapons are obtained by solving math problems. You start with a gun, and the game will inform when new weapons are obtained. The ammunition is achieved by killing enemies, solving mathematical exercises, and collecting books that release a type of enemy: the letters. Letters are special: when they die, they release books. Shooting the books gives new energy. Important: those books are not destroyed; they are sent to a virtual library, which will appear later in the game and will play an important role in future features of the game. You can configure the game so that, when the ammunition is finished, something more ammunition is generated automatically (see the config panel below). If you run out of ammo and it is not automatically generated, then get it with the secondary weapon: the 9 missiles. • Secondary weapon: the <9 missile>. The secondary weapon known as the “9” is activated with the right mouse button (or the LB button in the pad). It only serves enemies on the ground, and is always thrown straight and level. It explodes after a few seconds, if it does not hit an enemy. The secondary weapon is shaped like a “9”, and the ammunition counter of “9s” is indicated on the top right of the screen. They are gradually being generated over time. They are perfect for killing tough enemies like giant robots and lighting lasers. In general, a single impact is sufficient. Supporting weapons are the owl drone, the minigun, and the combat Mech. They are represented by symbols in the screen above right. When you activate one of these weapons, they will activate and will give you fire support for a while. Then they’ll disappear. You’ll know when they are ready again because their symbols will appear on the screen. There is also the teletransport. As the name says, it will teletransport to another random place. Useful when you are surrounded by enemies. • Supporting weapon: the owl. The owl is actually a bird-shaped drone. It is ready when an image of a bird can be seen at the top right of the screen. It can be invoked at any time by approaching a flag with the bird, or by pressing “o” or the corresponding button in the pad. The owl will stand for a while destroying air targets. It throws laser raids at nearby enemy ships. It is indestructible, which makes it very interesting for times that require air support. • Supporting weapon: the minigun turret. The minigun turret complements the owl. When you press “t” (yes, you also have it in the pad). It appears next to the player, and looks for land enemies for a while. Shoot very powerful laser bursts. It is a fully automated weapon, which chooses enemies for its firepower and proximity. It is perfect for cover fire when solving some math exercise. Its availability is indicated by an icon of a minigun machine gun at the top right of the screen. Important: they can not destroy the laser cylinders. • Supporting weapon: the Combat Mech. The Combat Mech can be activated like the owl drone or the automatic minigun. 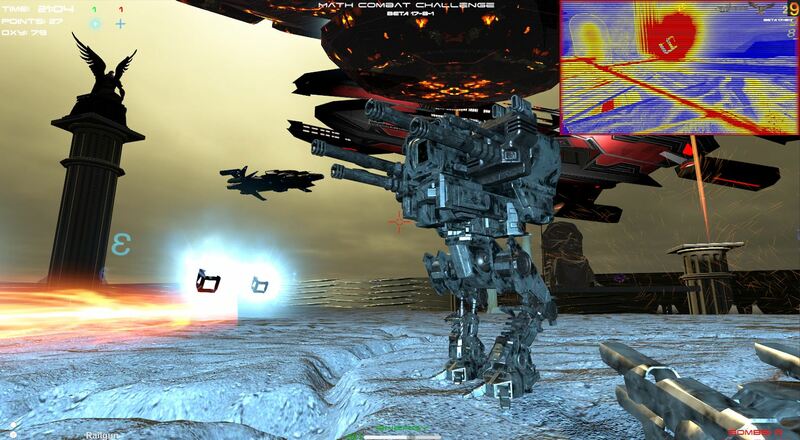 The Mech will arrive from the sky, will land, and will start to combat surface enemies. A little camera will be visible showing what the Mech can see. That can help you control other areas of the combat zone. The Mech will end its work and will fly away. You´ll be able to activate later when indicated in the screen, just like the owl and the minigun. The Math Balls occasionally fall from ships that pass through the stadium. 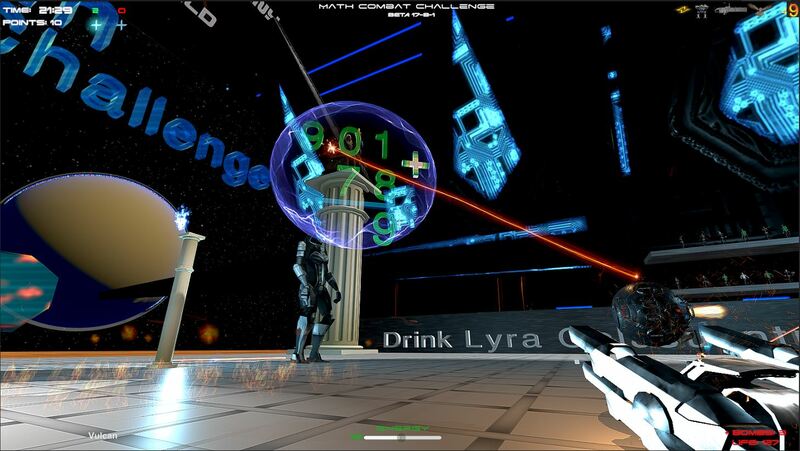 Shooting them allows them to be stored (you can see how many math balls you have below on the right), and for a few seconds this produces a higher score. When there are several letters nearby, you can press the button on the mouse wheel or the corresponding on the pad. This will cause all the letters in the stadium to explode, releasing books and giving the corresponding points. Remember: those books will be included in a library in the future and there will be new features about them. More info coming soon. When you are on the Titan Arena you’ll find a deactivated drone. You can activate it by touching the red box. The Drone will be active, and will move and will inform you where the active panel is. It will also shoot to some nearest enemies. After that it will go back to its place and deactivate itself. You can use this feature if you want to, but you’ll lose some random points at the end of the game. It’s your choice. 1. Low gravity (low gravity). It lets you jump great distances while running and shooting from the air. Be careful not to jump into outer space. 2. Without lights (light off): the lights go out. Your computer automatically connects the night viewer vision system. 3. Immortal (immortal): you will hear an alarm and v or vortex through the stadium. During those seconds the player to be immortal. Some of the enemies you’ll find in the game. They are the weakest enemies. The Zs are the weakest, and the “A’s” the most powerful. 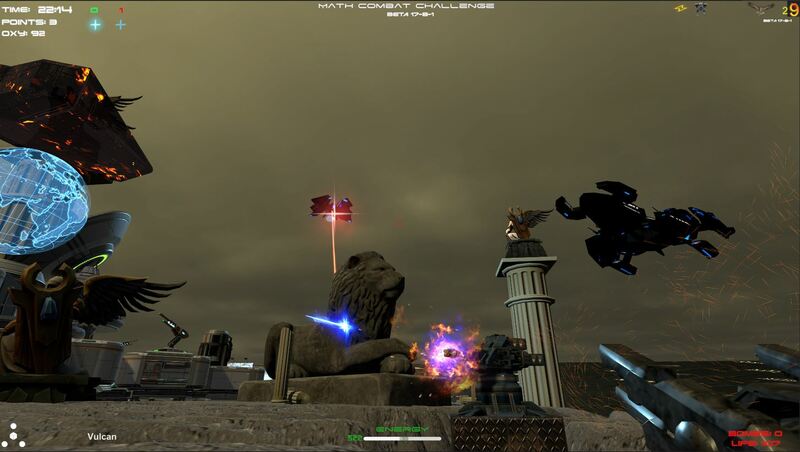 They approach the player and explode, in addition to throwing light weapons and missiles as they approach. Sometimes they leave books on the floor. If you shoot the books you get energy. Those books go to a Virtual Library, which will be accessible later. They fly through the high areas of the stadium, or Titan, sometimes one or sometimes in groups of two, firing lasers and missiles. The owl is very effective against these ships. Try to have it ready when they appear. Drones are only visible in Titan surface. They can be found almost anywhere, and are very powerful. Be careful, they detect when you submerge or when you go inside the forsaken base of Titan. They arrive from a ship that passes from time to time, and jump to the ground. They are not very powerful, but they attack in groups from different angles and move quickly, and this makes them fearsome. You will find them in the Stadium. They also arrive from a ship that passes from time to time, and jump to the ground. They are easy to destroy, but they also attack in groups from different angles and move quickly, and this makes them fearsome. They are long cylinders of light difficult to see, with four rotating lasers. They stick to the player and break it into pieces. They are immune to the minigun. Fire islands are areas that are moving around the stage at random. If touched, shields are lost while the contact continues. A ship that relays the competition passes through the stadium. Watch out for the laser. Also watch out for the rotating lasers on either side of Zeus. From time to time meteorites will fall in some area, almost always suspiciously close to the player. Avoid them at all costs. Sometimes a beast with three heads will attack, with powerful bursts of fire. Be careful. Statues and recovery of shields. The statues of Zeus and Athena have energy for the shields. If you approach them, they will recharge you some energy, perhaps enough to recover strength. Then wait an indefinite time to get another load. Athena also recharges the weapons completely. You can know how you’re doing at anytime by clicking “i” or the second central button of the pad. Then a dynamic statistics panel will appear and will refresh with new data as long as you have it activated. You get a final statistics when the game is over. It is also updated in your Steam Account. To access the panel, in the menu screen press the escape key or the pad configuration button (Xbox 360 / One or PS3 / PS4). The default values are good to start the first games. 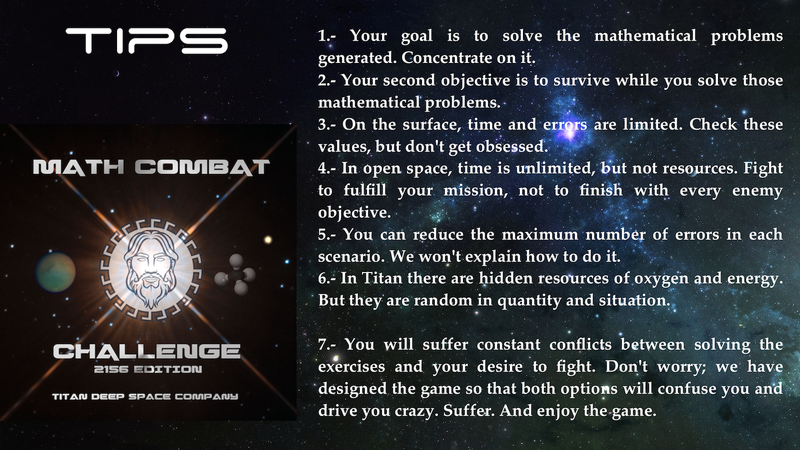 These parameters can be combined with each other to develop and customize the game in the way that each player wants. This allows a great number of combinations and possibilities, whether they are terrestrial or spatial arenas. • +: Indicates whether there will be operations of sum involved in each problem. • -: indicates whether there will subtraction operations involved in every problem. • *: Indicates whether there will be product operations involved in every problem. • /: Indicates whether there will be operations of division involved in every problem. Note that you can config the math operations for static and dynamic panels in each case. At least one of these options must be enabled. If you leave the four empty, the system will assume that only the sum is marked. Decimal comma: use a comma to separate decimals. Music: If active, you´ll have music during the game. However, in each arena the music can be turned on and off with the “M” key or in the configuration panel. First-degree equations: mathematical operations in the form of first-degree equations with one unknown. Quadratic equations: mathematical operations in the form of quadratic equations and one unknown. Decimals: Will there be decimals in operations? Invert numbers: If this option is enabled, the terrestrial scenarios can display inverted numbers for a while. These numbers act as wildcards while inverted. All the wrong solutions: if active, some panels may show erroneous solutions from time to time. You´ll never know when a panel will have or not have wrong solutions. Levels: There are four levels: easy, medium, difficult, crazy. The game is fairly balanced in middle mode. The easy mode is very simple. The difficult mode is, well, difficult, and the crazy mode well is almost impossible except for the best. Negatives: if active, there will be negative values in the results. Limit errors: if it is unlimited, errors are not considered, just counted. If it is a specific value, above that value you lose. Max. Digits: the number of digits that will have the results at most. If nothing is indicated, it is related to the level of difficulty. If a specific value is set, the operations will have at most a solution of those indicated digits. Max. Time: in the scenarios with time limit, is the maximum time to solve the exercises. From 2 minutes to 25 minutes. Meteors: if it is active, in the terrestrial scenarios there could be a meteor shower from time to time, which hit the player. No enemies: this option allows you to eliminate all enemies from the scenarios. You just only need to solve the mathematical problems without worrying about anything else. An afternoon of peace and mathematical concentration. Weapon Regeneration: If active, when the player runs out of energy, he or she may recover a little to be able to defend himself in the scenarios on the ground, or to recover a box of ammunition and energy in space. Crazy mode check: if activated, the generation of mathematical problems could increase from time to time, and almost always in the worst moments. Help Text: when active, help text will inform you how to proceed in the main menus. Help Drone: when active, a drone will show you how to proceed in the Stadium, and will mark the numbers to solve the two first static panels. Graphics quality: there are six levels to choose. Try the one that best fits with your computer. Resolucion: there are four resolutions available. Choose the resolution of the game that will fit to the best resolution if your monitor doesn’t support any of the present. We’ll add more resolutions soon. Max static panels. You can choose at least 2 static panels, and a maximum of 7. The game can be controlled with keyboard and mouse, or with a pad. For the starship, we recommend a pad. Any standard pad will be sufficient. 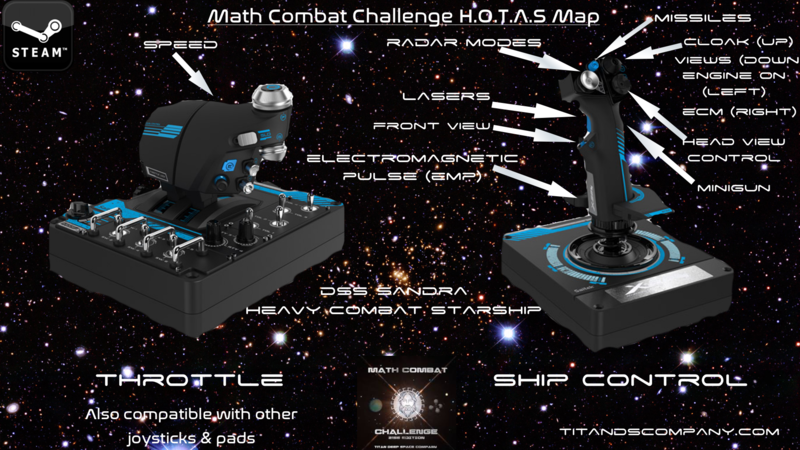 The ship can also be controlled with HOTAS controls like the Saitek X55/X56. Keyboard for first person view. Pad for first person view. The hud for the starship areas contains the elements described below. Please note that the ship contains some special elements that are explained in detail below. Important: you must activate the starship engine to move (left stick click). Activate the starship engine to move (left stick click). Activating a radar mode will inform of the nearest objective always. You can repeat the procedure to activate again the nearest objective (enemy ships, refuel cubes, or numbers, being the type of radar you have activated). The weapons won’t work in radar navigation mode. 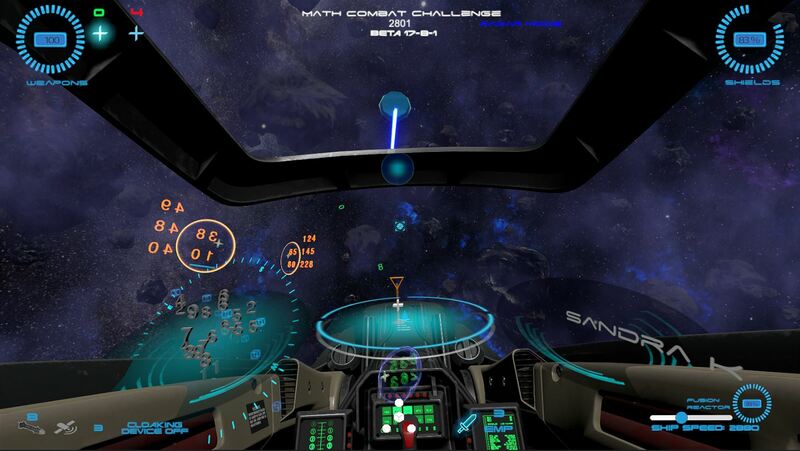 Find the number in space floating that matches the one that you must solve inside the cockpit from right to left. Activate number radar with D-Pad left (or with “R” key). If with D-Pad, repeat until the panel over the cockpit indicates the right number. Find the number and shoot. Repeat until the math problem is solved. Repeat then until the last math problem is finished. Avoid combat when possible by using the cloaking device “Y” button on the pad, or “H” keyboard. The cloak just last 30 seconds more or less, use that time to escape. You’ll see a bubble around the ship. Beware the cloaking device is unstable and experimental. If you need more missiles, energy and refuel, look for the cubes by activating the refuel radar (d-pad right or “P” keyboard). The radar will indicate the nearest refuel cube. Shoot to refuel and get new weapons. If you run out of gas your velocity will be very slow. 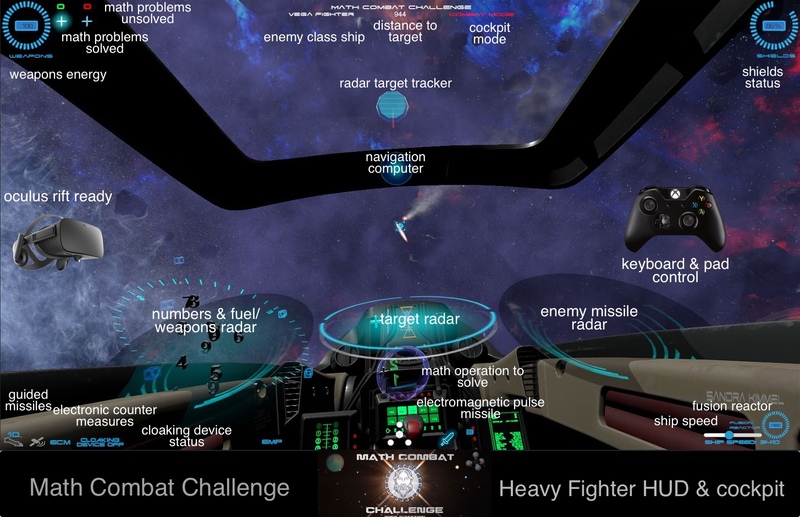 The main battle computer will inform you when other enemy ships have detected you. You will see them in the central radar. If you are If you are surrounded by enemy fighters, you can use an EMP (Electromagnetic Pulse). Remember: you only carry three and won´t get more even when refuelling. 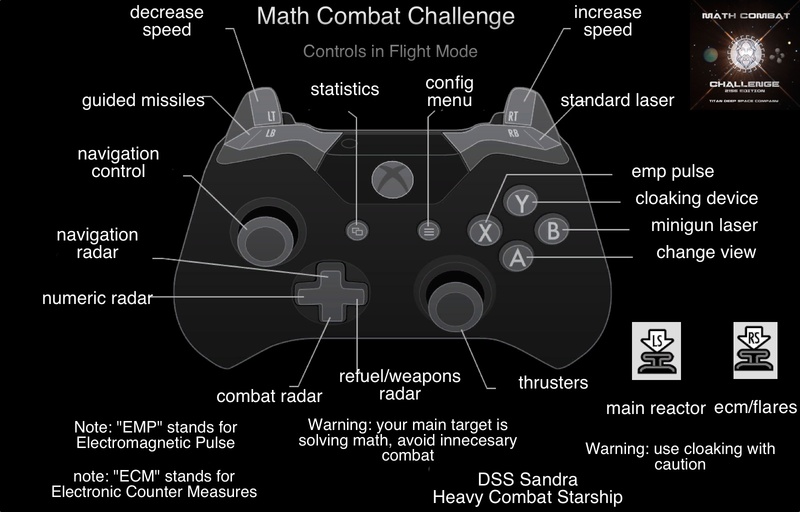 To activate the combat radar use the d-pad down or the “C” keyboard). Remember: the computer always indicates the nearest target. If you want to change the target, use the d-pad again. The minigun is very powerful but drains a lot of energy. Flying fast is good but drains a lot of energy. The ECM avoids some enemy missiles, but it drains energy from the fusion reactor and the enemy can detected further. All the ships above starfighters can send fighters if they’re attacked, specially the carriers. In space you are not limited in time to finish the mission. If you try to leave the space area you’ll be warned first, and then destroyed. You’ll find these tips also in the game. Don’t forget them.